Wonder of the French high fidelity world? Without a doubt, if you believe the mass of reviews in the international press. This new brand has been generating a buzz since it debuted in 2010 thanks to an investment in a massive marketing campaign. Incidentally, it seems to me that the funds invested in launching the brand resulted equally in fallout as in reviews of the brand’s products because it is rare to see investors raising several million euros to develop a French hifi brand. A unique object, it bears all the signatures of a luxury product: an elegant box – square, flat, with a designer aluminum frame. 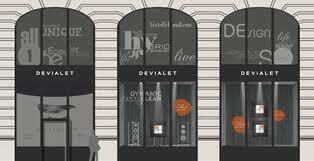 But Devialet also wants to differentiate itself via its innovative technological approach. It is the first amplifier to include ADH (analog-digital hybrid) technology: signal amplification is simultaneously analog and digital. The system also includes a preamplifier, two amplification stages, a 32-bit DAC, an asynchronous wifi receiver, an SD card to manage the proprietary software, and a large panoply of connectors. Furthermore, it can be configured according to your wishes. ADH technology is supposed to result in the best sound quality from all possible digital sources, and it is claimed that the hybrid system has exceptionally low distortion levels and exceptionally high signal-to-noise ratios. However, the magazine Stéréo Prestige questioned the company’s published values after testing the system itself in 2010 (180 W measured vs. the 240 W claimed; -0.3% of distortion measured vs. the 0.001% claimed; and -107 dB S/N measured vs. 130 dB claimed). 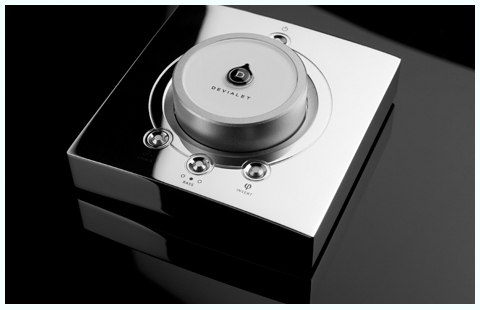 This technological promise, the fruit of 4 years of research, comes at a cost: a Devialet system starts at 12,000 €. The good news (or clever marketing strategy) is that Devialet is expanding its range of products to offer systems starting at 5,000 €. At this price, the customer is promised a part of the hybrid revolution. However, the starter system is less powerful: 2 x 110 W and missing some of the functions. The brand has announced that the streaming option will be available for 1000 € until September 30th. I recall rather clearly my listening experience in the Devialet showroom in Paris, which took place last January. It would be simply dishonest to say that system did not perform as expected. Indeed, its audio message was characterized by a remarkable level of precision, and I was really impressed by the machine’s available power. But its untapped potential and its sterilization of the sound left me hungering for more, still looking for the core essence of the music, its soul, even its small imperfections that remind the unconscious mind that music is made by humans, it is the result of work, the inspiration of an interpreter, and the work of a sound engineer. I came home with the desire to play an old vinyl record to rediscover the charming, but certainly imperfect, warmth of a «king of the blues ». I understand perfectly that innovation acts as a powerful lever in lifting the high fidelity market to new heights, but it is also only one step away from implying to the consumer that a technological revolution erases all preceding technologies. I am not sure that this permanent overabundance of technology is always in the best interests of music itself. In Devialet’s case, I continue to harbor this doubt and one certainty: the listening experience I had with this system was not the one that evoked the most emotions. This entry was posted on 14/05/2013 by Aublanc in Amplifiers, Untitled and tagged amplifier, audio equipment france, devialet, french amplifier, FRENCH HIFI, french high end, french loudspeakers, french stereo equipment, french stereo system, hi-fi Frankreich, hifi francés, hifi frankreich, hifi french brands, high end audio, high end audio france, impianto Hi-Fi, stereo equipment France, stereo system, stereo system France, Stereoanlage Frankreich.